Hi! 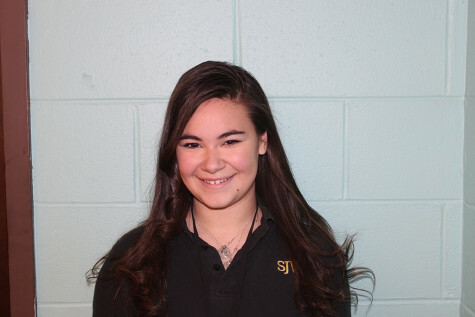 My name is Stephanie Brogna and I am a Senior at St. John Vianney. I am the Editor-in-Chief for our school newspaper. In addition to being the Editor-in-Chief, I also work as a Photographer and Writer for The Lancer's Point. I have been taking pictures since I was 8 years old, and I absolutely love the creativity it entails. I am excited to be the Editor-in-Chief because it gives me the ability to make our newspaper the best it can possibly be. I am also very excited to be a Photographer because I get to see all of the school activities through a different perspective. I also get to capture great moments so the entire newspaper team can share it with the people who could not enjoy the activity first hand. In addition to taking pictures, I love writing and creating stories. In school I am part of the Ambassador Club, Culinary Club, Key Club, and Italian Club, as well as the Newspaper. In addition to those clubs I am also in the National Honors Society and Italian National Honors Society. I also enjoy being captain of the Varsity Bowling team. Outside of school, I enjoy figure skating and have been taking lessons for 9 years. I also love baking (especially creating elaborate cupcakes) and creating scrapbooks for special occasions.